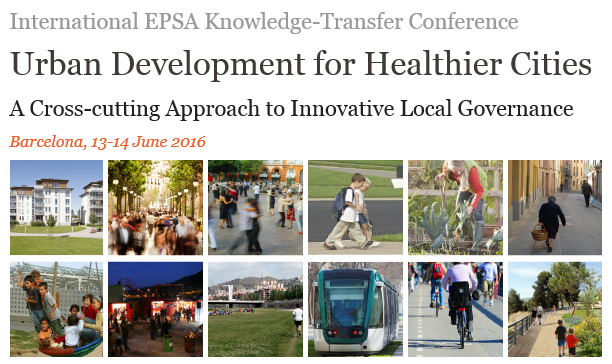 You can now register for the International EPSA Knowledge-Transfer Conference on Urban Development for Healthier Cities: A Cross-cutting Approach to Innovative Local Governance, which will take place in Barcelona (ES) on 13-14 June 2016. It is carried out by the European Institute of Public Administration (EIPA) and the Provincial Council of Barcelona, the EPSA 2015 winner of the cross-cutting award. This conference aims to bring together - from all over Europe - leading public sector and academic representatives in the field of integrated urban development and cross-disciplinary approaches for healthy local environments and holistic urban policies. Attendance to the conference is free of charge, so seize this opportunity and register soon! You can directly register by clicking here. For more detailed information, please consult the conference programme. We look forward to welcoming you to Barcelona!